A couple of days ago, I was asked if I’d like to create a recipe using Clover spread. Given that Clover is already my spread of choice, I jumped at the chance! This’ll be an easy one, I thought; but how do I show the flavour of Clover off to its full potential? 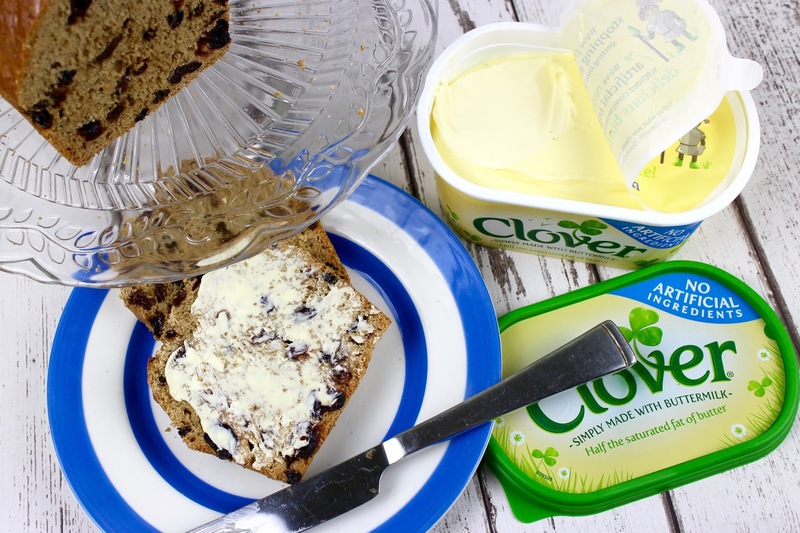 After a bit of chin-scratching, I decided to keep it really simple with a lovely tea loaf spread with lashings of Clover which would allow the great flavour to come through. The term ‘tea loaf’ is one that I think is a bit confusing… Is it a loaf made with tea? Or a loaf that’s perfect to drink with tea? Well, the truth is either or in this case BOTH! The important thing is that it has something to do with the ritual of afternoon tea and that’s good enough for me. 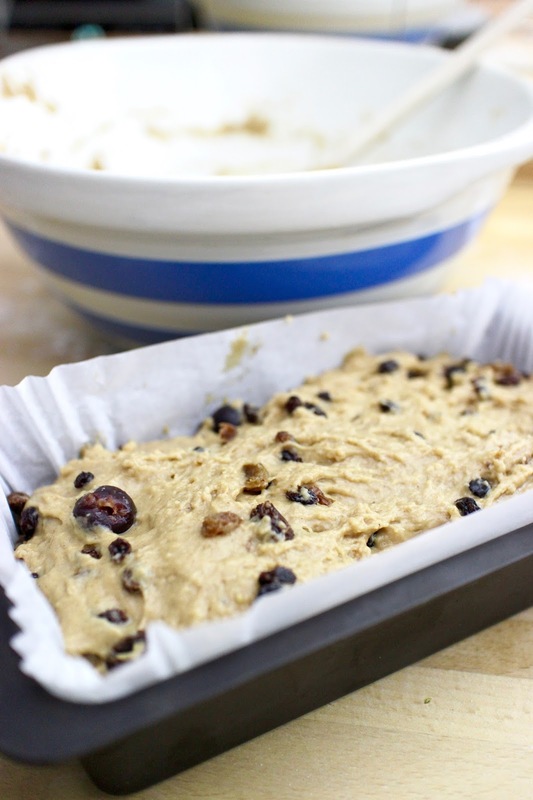 You’ll notice this recipe contains no fat and no eggs either… This is quite unusual but it does mean the loaf will keep really well without going stale. I’ve kept this loaf for a week before with no problem at all. It’s also a really forgiving and adaptable recipe. You can play around with it until you get something that suits you. Feel free to use different fruit – I’ve used some morello cherries in mine as I wanted to use them up! You can also use whatever sugar is in your cupboard and it will still be very tasty. I have even swapped the tea for coffee and added some walnuts into the mix. Delicious! 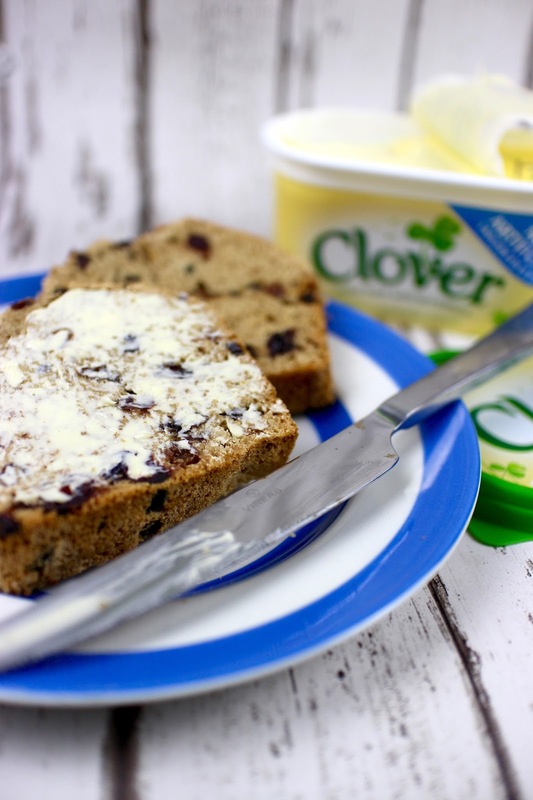 The Clover adds a beautiful buttery flavour to the cut loaf and I can rest assured as I know it contains no artificial nasties whatsoever! It’s also made from buttermilk, which means it contains half the saturated fat of butter and is a great ingredient to use in healthy family meals. 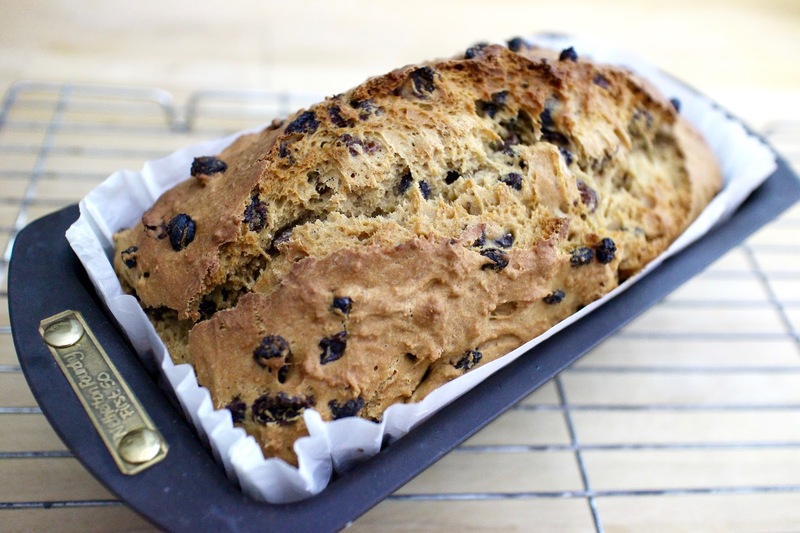 This tea loaf is unbelievably simple yet so very delicious. Jam packed with fruit and best served with lashings of butter and a strong cup of tea. 1. Pour the tea over the fruit and leave to soak until completely cold. I leave the teabag in, to make sure the tea is as strong as possible. Whilst the fruit is soaking, preheat the oven to 160ºC. 2. 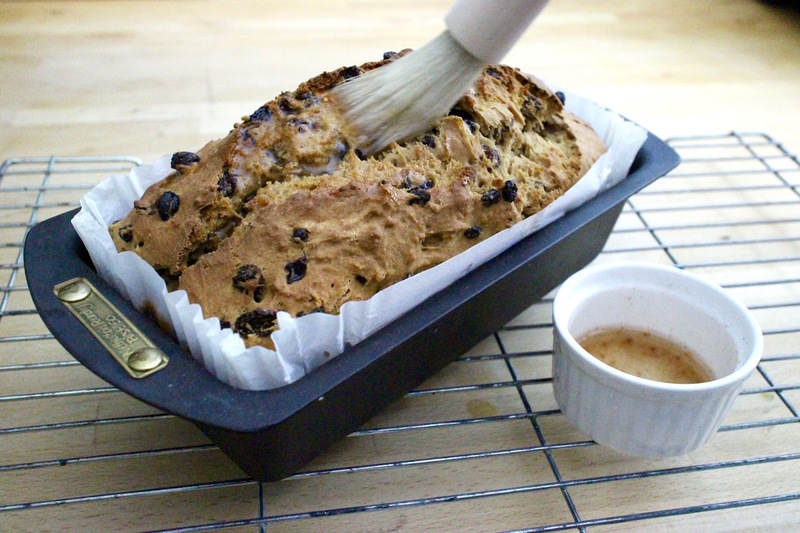 Stir the light muscovado sugar, flour and mixed spice into the fruit and tea until thoroughly combined then spoon into a lined or greased loaf tin. 3. Bake for 50-55 mins, or until completely cooked and a golden brown. I like to turn it half way through; it won’t collapse like a cake if you open the oven. 4. As soon as the loaf is out of the oven, combine the ingredients for the glaze and brush all over the top of the loaf to achieve a beautiful, rich sheen. 5. Remove from the tin and leave to cool completely. 6. Slice and serve spread with lashings of Clover. I hope you try and love this tea loaf! Any questions or comments? Let me know in the comments box below. Clover would also love you to pop over to their Facebook page, where you can win personalised fridge magnets by sharing pictures of your dishes made with Clover. Good luck! Disclaimer: This post was commissioned by Clover. As always, all views expressed are my own personal opinions. No fat or eggs in the load?! How clever! Very impressive Kevin I'd love a slice right now! Looks delicious – thinking would be fabulous for breakfast. 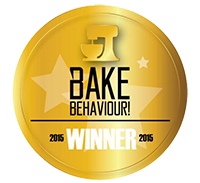 Love that it is egg free – the toddler next door is allergic so am always looking for recipes that he can eat too.